Nestled among the pines and aspen in Colorado's scenic Blue River Valley is a secluded mountain vacation getaway. Kirby Creek Lodge---named after a beloved family dog---is nestled in 1.5-acres of woods, a wild meadow and wetlands along the banks of Kirby Creek, a bubbling mountain stream where miners once prospected for gold. 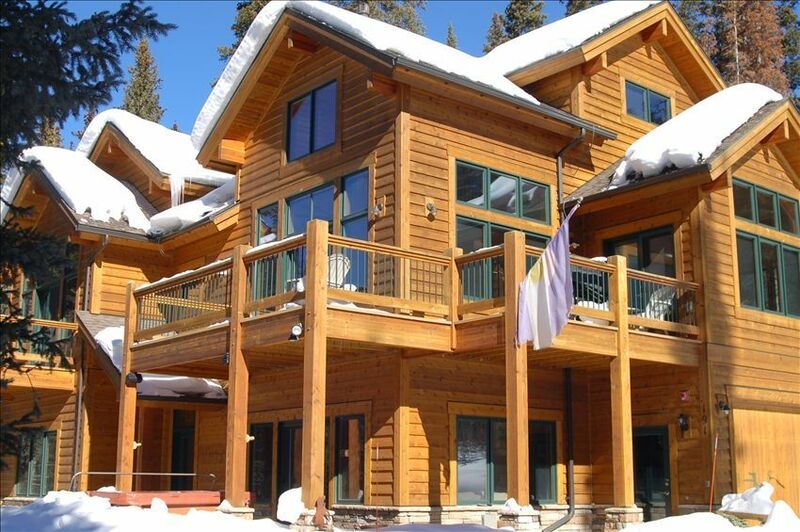 Kirby Creek Lodge is a new, architect-designed home with four bedrooms, three-and-a-half bathrooms, gourmet kitchen, study, and two decks with south and west exposures that provide wonderful mountain views and sun throughout the day. This home was designed for a family that enjoys time together and appreciates quiet spaces for reading or reflection. The home includes two fireplaces, spacious great room and loft, family room with a surround-sound entertainment center, gas grill, steam shower and outdoor hot tub. Window seats on every level provide quiet nooks for reading or solitude. For those who want to combine work and play. Kirby Creek Lodge is well suited for two families with young children or teenagers or up to four adult couples. It provides an inviting setting for a good book and wonderful mountain views, or an easy drive to the diverse world of activities in the Breckenridge area. It is located less than a mile from Quandary Peak, one of Colorado's majestic 14,000-foot mountains, and is minutes from skiing, shopping, dining, music and nightlife. In addition to the 10-mile range of ski slopes for which Breckenridge is famous, other world class skiing is within 45 minutes' drive, including Vail, Copper, Keystone, Beaver Creek, Loveland and Arapahoe Basin. Fishing, golf, hiking, rafting, snowshoeing, snowmobiling, cross-country skiing, road and mountain biking, ice skating and horseback riding make the Breckenridge area a year-around destination for outdoor activities. We hope you enjoy our wonderful home! We find the size and beauty of the mountains energizing and peaceful at the same time. Our home is on a beautiful piece of land that gives us much privacy and great views of our surroundings. At the same time, we are a short drive to all that Breckenridge has to offer, with its many outdoor activities, restaurants and shopping. In addition to exploring Breckenridge and the great outdoors, when at our home, there are many places to sit in the sun, read a book, or enjoy a long soak in the hot tub. We enjoy cooking, and our big kitchen and dining area is a great place to entertain friends. We had a great time at Kirby Creek. The house is beautiful and no detail is overlooked; from the monogrammed towels to the steam shower to the well appointed kitchen. It doesn't get much nicer than Kirby Creek! The owner was quick to get us the information we needed for our stay and was great to work with. We hope to be back again in the near future. I would highly recommend this property! Everything You Want and Expect! You walk into an immaculately clean home that is both warm and inviting. The floor to ceiling windows make the mountains an integral part of the experience. The hot tub was well maintained and easy to use. The wet bar downstairs was a nice plus and convenient to the hot tub. The location is close to Breckenridge so easy to run into town anytime we wanted. We can't say enough good things! You will not be disappointed. We've stayed in Blue River three times and this is by far the most complete package yet. Highly recommended! We had an incredible time staying here over the Thanksgiving holiday last year! We are already hoping to return soon! The accomodations were exactly as described - and perfect for multiple families! The kitchen was well stocked and everytime we thought we had seen it all, we came across another luxury! The hot tub was perfect and the master suite was fabulous! What an amazing place! We shared this spacious, luxurious home with three other families and had plenty of room to spare. We especially enjoyed the two different family areas, the in-ceiling/whole-house sound system, and the fully stocked, state-of-the-art kitchen. Trail heads for McCollough Gulch, Crystal Lakes, Blue Lakes, Quandary Peak and Mohawk Lakes were all 5-10 minutes away. It's an easy drive to town, too. You'll find some great literature around the house, too. I hope we have a chance to visit again.